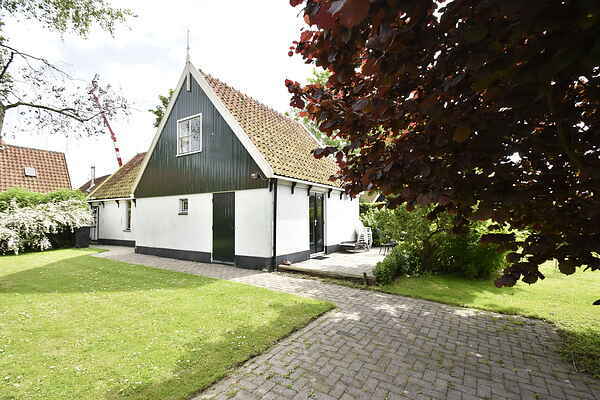 At the bottom of the West-Frisian Circular Dyke, in the historical village of Kolhorn, close to the North Holland coast and the IJsselmeer, you will find this pleasant holiday home. It's a holiday home by the water and it's a lovely place to relax. After a long day in the fresh air, you can snuggle up around the wood stove in the living room. The open kitchen is equipped with all amenities. It includes a Quooker, slow cooker, two ovens and a large worktop, so you can enjoy cooking wonderful meals. On the ground floor, you will find a spacious bedroom with patio doors to the garden, and an adjoining bathroom with shower, bath tub and washbasin. Take the steep staircase to the first floor, where you can find two further bedrooms, a solarium and a laundry room. You can park at 300 metres from the holiday home along the dyke, or a little further along on the large parking area in front of the 't Anker restaurant. Kolhorn is a former fishing village on the Zuiderzee. You can still see a lot of this as you stroll through the village. The area also has many activities and attractions. The IJsselmeer, Amstelmeer and the North Sea beach can be reached very easily. The lovely towns of Schagen, Alkmaar and Den Helder are all certainly worth a visit. Kolhorn is known for its Turf Museum and the lovely night markets during the months of June, July and August.